KUALA LUMPUR THE ASSOCIATED PRESS--A day after the high-profile vote which awarded Beijing the 2022 Winter Games, International Olympic Committee members on Aug. 1 dealt with issues affecting the next two Summer Games--the fuss over Tokyo's choice of emblem and severe water pollution in Rio de Janeiro. Earlier this month, the Japanese government threw out the design plans for the main stadium for the 2020 Tokyo Games amid public criticism of the 252 billion yen ($2 billion) price tag, which was nearly double the original estimate and would have made it the most expensive sports stadium ever. 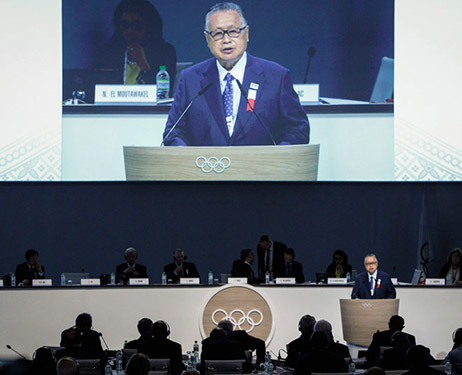 Tokyo organizing committee head Yoshio Mori later apologized, a gesture IOC President Thomas Bach said on Aug. 1 wasn't really necessary. But Tokyo officials now find themselves involved in another controversy over an emblem they unveiled--it's based on a "T," standing for Tokyo, team and tomorrow. But the 2013 logo for a theater in Liege, Belgium, has similar shapes in white against a black backdrop, and the designer of that logo says it will approach the IOC and ask them to change it. IOC Vice President John Coates of Australia, who heads the coordination commission for the Tokyo Games, said the IOC did everything required ahead of the emblem's unveiling. "The IOC and Tokyo had checked all of the copyright registers," Coates said. "We have looked at both designs and we don't think we have a problem." Mori said on Aug. 1 that the logo was developed over six months and "we've gone through the proper processes." In other Tokyo news, Coates said the number of extra athletes as a result of new sports being added to the program will be capped at 500. Eight sports are on a short list for consideration, with a final decision to be made by the IOC in August 2016. Tokyo organizers are expected to recommend baseball and softball, both popular in Japan. But the 500-athlete quota--which Mori said he'd heard only for the first time on Aug. 1--would likely only allow baseball and softball, and possibly one other sport to be added, owing to the number of players on those team sports.